11 Apr. 11 Aug. 11 Dec.
To him that newly cometh to change his life, let not an easy entrance be granted, but, as the Apostle saith, “Try the spirits if they be of God.” If, therefore, he that cometh persevere in knocking, and after four or five days seem patiently to endure the wrongs done to him and the difficulty made about his coming in, and to persist in his petition, let entrance be granted him, and let him be in the guest-house for a few days. Afterwards let him go into the Novitiate, where he is to meditate and study, to take his meals and to sleep. Let a senior, one who is skilled in gaining souls, be appointed over him to watch him with the utmost care, and to see whether he is truly seeking God, and is fervent in the Work of God, in obedience and in humiliations. Let all the hard and rugged paths by which we walk towards God be set before him. And if he promise steadfastly to persevere, after the lapse of two months let this Rule be read through to him, with these words: “Behold the law, under which thou desirest to fight. If thou canst observe it, enter in; if thou canst not, freely depart.” If he still stand firm, let him be taken back to the aforesaid cell of the Novices, and again tried with all patience. And, after a space of six months, let the Rule be again read to him, that he may know unto what he cometh. Should he still persevere, after four months let the same Rule be read to him once more. And if, having well considered within himself, he promise to keep it in all things, and to observe everything that is commanded him, then let him be received into the community, knowing that he is now bound by the law of the Rule, so that from that day forward he cannot depart from the Monastery, nor shake from off his neck the yoke of the Rule, which after such prolonged deliberation he was free either to refuse or to accept. 1. Is a man truly seeking God? 2. Is he eager to seek God in the Opus Dei? 3. Is he resolved to seek God in obedience? 4. Is he set on seeking God in humiliations? Chapter LVIII contains, all the same, much more. It is a good thing that we read this chapter together three times a year. 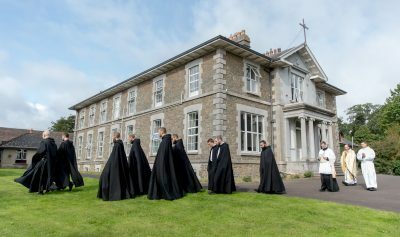 The Holy Rule participates in certain qualities of Sacred Scripture and of Tradition: it is an inexhaustible storehouse from which the abbot is bound to draw out things new and old. Ideo omnis scriba doctus in regno cælorum, similis est homini patrifamilias, qui profert de thesauro suo nova et vetera. Labour to admit you, but Oh, to no end. Saint Benedict says that the man knocking at the monastery door should not be granted an easy entrance. It is customary to set before an enquirer all of the things that he will find hard in the monastery. An enquirer should never be made to feel that the monastery needs him, that all are waiting “with bated breath and whispering humbleness” (Shakespeare, The Merchant of Venice) for him to make his decision. The postulant is shown the crucifix, the image of the naked Christ nailed to the tree in sacrificial immolation. 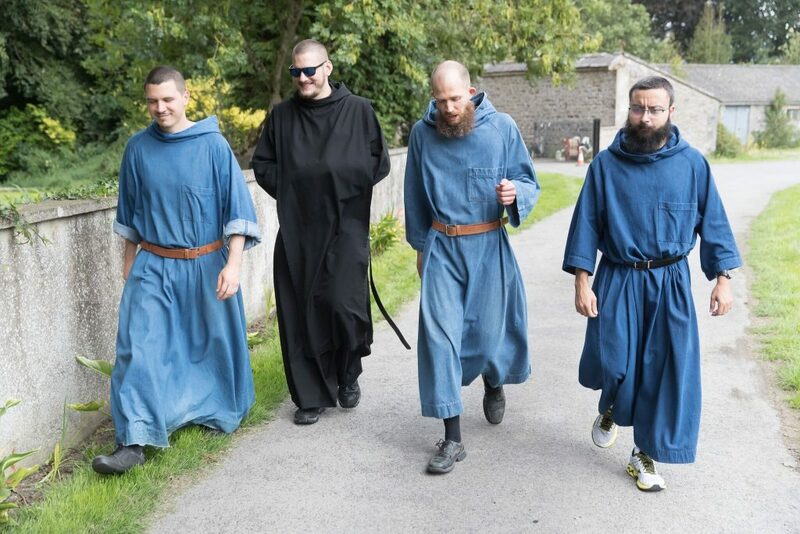 The postulant comes to the monastery to lose what he thinks he has acquired, and to walk humbly along the via crucis, keeping pace with a family of fathers and brothers in the footsteps of Christ. This is the sequela Christi. A man follows Christ because, as in the case of the rich young man of the Gospel, “Jesus looking on him, loved him” (Mark 10:21). Once a man’s eyes have met the gaze of Jesus, it becomes impossible, apart from the love of Jesus, to make sense of one’s life. Trahe me, post te curremus in odorem unguentorum tuorum. Admitted to the noviceship, the new brother will live among other new brothers, somewhat apart from the rest of the community and under the watchful care of a “senior skilled in gaining souls”. We have not, up until now, been able to practice this particular prescription of the Rule but, with the construction of the new noviciate cells, it will be possible to come closer to what Saint Benedict sets forth, and this is my intention. What if my mind was full of bitterness, what if I was pierced to the heart? standing there like a brute beast in thy presence. Yet ever thou art at my side, ever holdest me by my right hand. Thine to guide me with thy counsel, thine to welcome me into glory at last. What else does heaven hold for me, but thyself? What charm for me has earth, here at thy side? What though flesh of mine, heart of mine, should waste away? Still God will be my heart’s stronghold, eternally my inheritance. within the gates of royal Sion I will be the herald of thy praise.